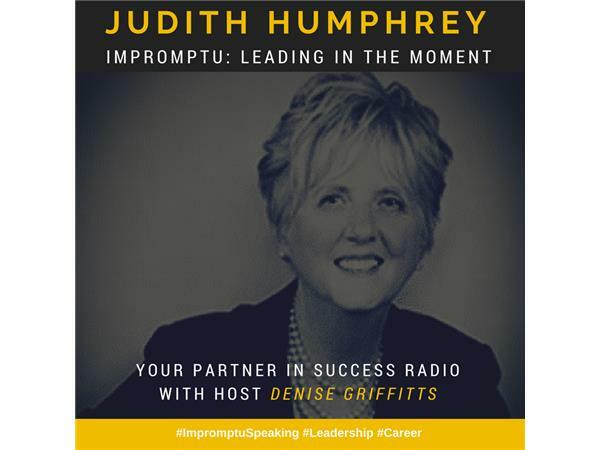 Judith Humphrey joins host Denise Griffitts to explain how preparing for impromptu speaking moments make you seem more engaging, professional, and thoughtful. Judith Humphrey is the founder of The Humphrey Group, a premier leadership communications firm. She is a communications expert whose business teaches global clients how to communicate as confident, compelling leaders. Judith is the author of three books ('Speaking As a Leader: How to Lead Every Time You Speak...From Board Rooms to Meeting Rooms, From Town Halls to Phone Calls', 'Taking the Stage: How Women Can Speak Up, Stand Out, and Succeed', and the upcoming 'Impromptu: Leading in the Moment'). She is also an acclaimed speaker, a columnist in Fast Company, and a top Global Communications Guru. Judith received an M.A. in English from The University of Rochester. She was awarded the 2012 YWCA’S prestigious Woman of Distinction award for Entrepreneurship.